YEREVAN, Armenia, March 15, 2012 (ENS) – The Armenia Tree Project’s 18-year-long effort to reforest the Caucasus country with tree planting, environmental education, and sustainable development was rewarded this week with a $1.2 million grant from the Norwegian Ministry of Foreign Affairs. Since 1994, the nonprofit organization, which is based both in Yarevan and Massachusetts, has worked to combat desertification in the biologically diverse but imperiled Caucasus region. Over 3,500,000 trees have been planted and restored and hundreds of jobs have been created for Armenians in seasonal tree-regeneration programs. The Norway funding will provide partial support for tree planting initiatives in towns and villages throughout Armenia, an expansion of reforestation programs in northern Armenia, maintenance of recently planted forests, environmental education programs that train teachers and inspire youth, and community training for sustainable forest management. 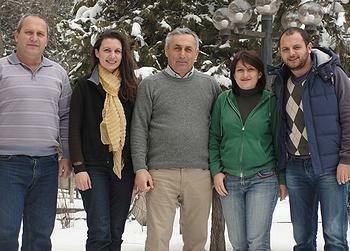 Armenia Tree Project launched a new program in 2011 known as SEEDS, or Social, Economic, and Environmental Development for Sustainability. It has allowed the organization to build capacity in its reforestation programs while improving results through a greater emphasis on community development and investing in social capital in the areas where ATP is planting trees. 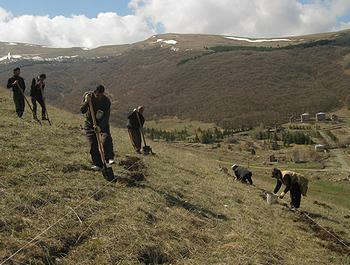 In 2011, the SEEDS Program planted 186,785 tree seedlings on community lands in Fioletovo, Jrashen, Katnajur, Spitak, and Tsakhkaber in Armenia’s Lori region. The SEEDS team also improved survival rates by clearing grass around thousands of seedlings that survived their first growing season. ATP’s stated mission is to assist the Armenian people in using trees to improve their standard of living and protect the environment, guided by the need to promote self-sufficiency, aid those with the fewest resources first, and conserve the indigenous ecosystem. The seedlings for ATP’s reforestation programs are grown in the Mirak Family Nursery in Margahovit Village and in backyard nurseries in the Getik River Valley. These newly planted forests are established with oak, pine, ash, apple, and pear seedlings which are native to the region. “In addition to planting trees, ATP’s SEEDS Program also addresses community development and socio-economic issues in order to mitigate some of the root causes of deforestation and unsustainable land use,” says Melikyan.